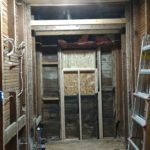 Bathroom remodel on the 1918 house. It was torn down to the wall studs and built back up from there. It needed a little bit of everything from floor & wall repair, to final paint and much between. 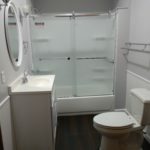 It received a new electric circuit, water supply lines & shutoffs, exhaust fan with metal duct to outside, faucets, tub and contemporary sliding door, vanity and mirror. The fixtures were Delta from a matching collection including a grab bar in the shower. Wood blocking in the walls allows for secure attachment of more grab bars if necessary.